The idyllic fishing village of Leam Markham in Trang Province, Southern Thailand, is a classic example of how restoration of coastal mangrove forests can bring a new wave of prosperity to poverty-stricken fisherfolk, writes Ong Ju Lin. The fishing village of Lean Markham in Trang province is cradled in a lush mangrove forest on the coast of southern Thailand, off the Andaman Sea. BU NUANSI came home tired but smiling. Wiping his furrowed brows, he pulled out a stool and gestured to us to sit with him. A cat lying nearby stretched itself and sauntered off. The sweet aroma of fried cempedak, served for tea, was invigorating on that hot, humid afternoon. The good news that the village elder, popularly known as Pak Bu, bore that day was like the clear blue sky – a respite from the monsoon rains. Pak Bu, 67, turned conservationist when he realised the only way for his people to eat and live well was to organise themselves to fight for their rights and to protect the environment. He had relinquished his post as village imam (Islamic religious head) to focus on environmental protection and community development. Pak Bu and his men had just returned from the Muang District police station after having their statements recorded. The day before, he and 10 villagers escorted by policemen had gone out in three boats to arrest a recalcitrant fishing trawler which had eluded them for six years. They gave chase and surrounded the boat. The four men on board surrendered. The fishing trawler had been infiltrating the 3km coastal conservation zone, dredging the seabed and destroying traditional fishing gear for years. Their faster Apollo boat always managed to evade the smaller fishing boats belonging to subsistence-based fisherfolk. “Reporters interviewed me this morning. When our story is published it will become a hot issue. The owner of the trawler wanted to settle the matter by paying us off but the whole village refused. The four men are now in police lock-up,” said Pak Bu. Until recently, such initiative and group action were unheard of in this quiet Muslim community in a Buddhist majority country. For years, they were victims of commercial trawlers, destructive fishing practices and middlemen. Their complains fell on deaf ears as they believed, rich owners of commercial trawlers were in league with corrupt government officials. Weak enforcement saw big trawlers flouting sea laws. Their huge gaping trawler nets scraped the seabed, crunching up coral reefs and hauling in fries before they had time to grow. Depleted catches forced some fishermen to resort to dynamite fishing and cyanide poisoning which further degraded the marine ecosystem. Soon the men were returning from sea with empty nets. To help support their families, the women worked for meagre wages in factories, leaving behind malnourished children under the care of the elderly. Impoverished and helpless, the community fell into debt to middlemen. Many turned to chopping down mangrove wood for charcoal factories to eke out a living. Over the last two and a half decades, more than 50% of the vast mangrove forests along Thailand’s 2,560km-coastline had been destroyed by charcoal companies and tiger prawn aquaculture. The degraded mangroves resulted in even smaller catches and the people were unable to break free from the cycle of poverty. It was at that low point that Yadfon (Raindrop) Association established contact with this remote village, accessible then only by boat. “When we first came here 19 years ago, there were so many problems we didn’t know where to start. But we were determined to help out, so we stayed on and slowly learned from the villagers and gained their trust,” said Pisit Charnsnoh, 57, who co-founded the organisation with his wife, Luong. Pisit Chansnoh with a map of the river basin. “Yadfon creates a learning process. We are not standing in front and teaching. We give equal respect and learn from each other to create something new,” said Pisit, a graduate in animal husbandry. Their early work includes digging wells to supply clean drinking water, setting up revolving funds for the poor to buy fishing gear and engines for their boats, and rearing of groupers which was very profitable at that time. In 1986, Yadfon and Pak Bu helped the villagers to create a 95ha community mangrove forest which covered Leam Markham and the neighbouring villages. It was the first of its kind in Thailand. The restoration results were dramatic. From 1991 to 1994, there was a 40% increase in total catch, resulting in increased income levels in the local villages. The success of the community forest caught the attention of the government which gave its tacit support. Three years ago, charcoal concession was abolished as a result of Yadfon’s work and years of lobbying by environmental groups. Today, there are nine community managed forests modelled after Leam Markham. The grassroot effort inspired the first-ever popularly-written Community Forest Act which is currently awaiting parliamentary sanction. The Act mandates that villagers are allowed to live and harvest from the forest if they can properly manage the forest in a sustainable manner. During our trip, we were also taken on a mangrove tour in a fishing boat by Meliwan Menpoh, 36, head of the Leam Markham Women’s Cooperative. She had helped to replant the mangroves and was proud to show us the results of her village’s collective effort. Meliwan Menpoh showing us the mangroves she helped to replant. At the periphery, two signboards bore the words “Community Mangrove Forest”. As we glided along the canal flanked by verdant mangrove trees, Meliwan pointed out several species whose leaves, roots or barks have medicinal values. 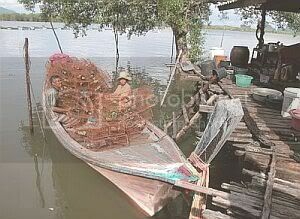 Since the mangroves grew back, the fish, crabs and shellfish have returned, said Meliwan. Their nets are full. The children no longer go hungry. In the neighbouring village of Tung Tase, the women took us on the 750m mangrove boardwalk sponsored by the Queen of Thailand. With dexterity, they descended the swampy earth and walked with ease among the gnarled roots. One of them bent down and plucked out a clam from the mud. Then another, and another. Soon her hands were full. Scanning the rich black mass, I could not even spot one measly clam, while she was already returning the ones she picked back to the exact spots she found them. The mangrove forest is like a “supermarket” to the villagers. The only difference is that the items are free for all. Back at the women’s co-op, we had curried clams and bamboo shoots. In fact, everything that was laid on the mat was locally harvested. Globalisation has yet to make its mark here. Part of Yadfon’s work is empowering the women to play an essential role in environmental protection and community building. In almost all the communities that Yadfon has touched, there is a women’s co-op to generate funds to supplement the family income or tide the family over during the monsoon months when the men cannot go out to sea. In Leam Markham, the women also weave baskets, purses and spectacle cases from pandanus (mengkuang) leaves. The plant grows in abundance in the area. Further south from Leam Markham in Thambon village, the sale of handicraft has become the main source of income during the monsoons. When the men could not go out to sea, they would take over the women’s traditional role. Buya Yaji, 46, is proud that her husband has taken to weaving baskets and purses, and can make them more skilfully then she could, although not as fast. Luong, who helped set up the co-op in 1986, said that weaving has given the elderly a productive activity and a way to contribute to the family income. A Thammasat University graduate, Luong shares a warm intimacy with the womenfolk. Almost 30 years ago, as a young activist, she had helped the villagers to get a piece of land to build a school. Many of the women in the co-op were educated there. When she returned to the village in 1985, it was a reunion of sorts and the community was open to Yadfon’s community development work. Leam Markham’s model of sustainability has been repeated in 40 other coastal communities in Trang province and it is now spreading inland. It is Pisit’s dream to see the conservation of the whole watershed area, and the communities living sustainably along the length of the river. 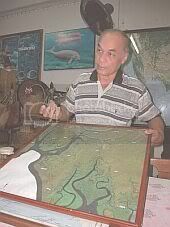 Yadfon Association president Pisit Charnsoh explaining the importance of conserving the Trang wetlands in its entirety. Upriver, it is not the protection of mangroves or seagrass, but the conservation of the sago ecosystem which is dominant in brackish wetlands. A Centre of Sago Learning has been set up to teach children about the importance of sago as a food source, as material for roof thatch and forest covering for water catchments. Yadfon’s work has not gone unnoticed. Last year, Pisit won the prestigious Goldman Environmental Prize and US$125,000 (RM$475,000) for his work in improving the conditions of poor fishing communities in Trang. With their four children all grown, Pisit and Luong want to spend more time cultivating their half hectare of land, now overgrown with weeds but bountiful with rambutans, mangosteens and durians. “We’re so busy, we never have time to live in our dream house in the village,” said Luong. Both are past retirement age but carry on with the same fervour that they had when they first returned to Trang. But their work is not over. Ultimately, they want to see communities becoming guardians of the entire watershed ecosystem. Asked what drives him, Pisit said it is his vision to see man co-existing peacefully with nature. Visit my site about link popularity!